1. What is paramount and minor in trainings for each of three brothers? And what age of each of brothers? - You know, for us there are no concepts - paramount or minor. On trainings all is important - both endurance, and force, and technics, all is the main thing, paramount. 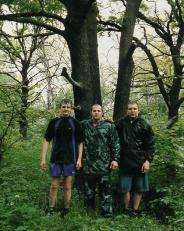 And as to age, Fedor was born on September, 28, 1976, Alexander - on August, 2, 1981, and Ivan - on June, 23, 1988. 2. Whether the most younger brother (Ivan) is going to follow the lead of the senior brothers and to engage in the mixed fights? - While Ivan is engaged in boxing, and struggles a little. The basic orientation, certainly, is boxing, and we wait from him for successes in this kind of sports. Though, certainly, he has a big desire to engage in the MA. 3. Why Fedor and Alexander have left team “Russian Top Team” and went in team “Red Devil FT”? Why in this team? 4. Fedor and Alexander never lost in the mixed fights. What reason of such success and stability of performances? - We train much, and all trainings we try to carry out intelligently that with each training it is more and more to be improved. We prepare for each fight thoroughly, there is no such fight to which personally I (Fedor) would not approach very crucially, seriously. I am confident, Alexander too. has shown good technics of leaving from difficult situations and has lead good receptions. Coleman and Randleman - good fighters, but they could not win him. Where he studied in technics similar these? - It is the mixed technics of struggle a judo and sambo-wrestling. All these receptions studied in sambo-wrestling, only there are small updatings: as in the mixed fights it is necessary to carry out all receptions without capture - on a naked body (we struggle without a kimono) - specially for mixed fights we struggle without a kimono. And in technics studied by the trainer Voronov Vladimir Mihajlovich struggle. 6. Fedor looks very kind, counterbalanced and polite person how it has come to such rather rigid kind of single combats as the mixed fights? - It was no money, it was necessary to go to earn on mixed fights. 7. Alexander has many known tattooes (many of them have been printed in the Japanese magazines). What one of them representing death with the child means? Fedor opposite does not have any tattoo, why? - Alexander not so long ago gave the answer to this question in the interview (on April, 1), to familiarize with which is possible on this web-site. 8. Brothers Emelyanenko do not show any emotions being in a ring, they always show calmness at struggle. They prepare mentally before struggle? - Probably, such approach was generated in the course of time, and may be is genetically. I, for example, leave on fight prepared and quiet, I do not obscure a head any nonsense as should be extremely close and at the first moment to lead reception. Therefore, that nothing prevented me, I try to cast away all ideas. know Fedor, he is very popular figure. And in Russia? Whether show fights PRIDE on the Russian TV, and whether it is valid is he known in his native city? - In my native city I am very well know. And as to translation of fights PRIDE, - unfortunately, on the Russian TV they were not conducted. The only thing, now Vadim Filkenshtejn - the manager of team “Red Devil” - shines all fights on Russian channel TNT. Thus, people gradually learns about fights PRIDE. 10. Participation in fights PRIDE speaks about the big fees. As far as it is important for brothers? - Fights - our work, and we try to do her maximum well - it is important for us. 11. What week of trainings for Fedor (week loadings on trainings are meant) means? And who trains together with him? - Week of trainings is for me an original cycle. On such cycles the period of preparation for competitions is designed. Loading thus can be the most different. She is distributed depending on what I try to achieve, on what I do the basic emphasis - on force, endurance, either for the speed, or on restoration of forces if, for example, I prepare myself to competitions. And as to joint trainings, - recently on a regular basis we train with Roman Zentsov (from team “Red Devil”), there came to Stary Oskol Sergey Kaznovsky twice, and recently after fortnight joint trainings there has left for Saint Petersburg Sergey Goljaev (we, by the way, periodically leave in Saint Petersburgto be trained with fighters from “Red Devil”). And next week is going to arrive us Ukrainian fighter Igor Vovchanchin. Well and basically, certainly, we train with the brother. 12. Alexander and Fedor - both heavyweights, and they will not struggle with with each other. Alexander about participation in Pancrase or UFC, where he can be the champion also? - Actually there are negotiations with UFÑ, but not with Pancrase, and with K-1, also negotiations are conducted with Inoki with PRIDE. Probably, Alexander will take part in these versions. 13. Fedor's what plans after leaving from the mixed fights? - Friendly speaking, did not think yet of it. 14. What do the wife and Fedor's parents think of his career of the professional fighter on the mixed fights? - They very much worry, but also proud. And I am grateful native, that they with understanding concern to me, my choice. 15. Whether Fedor thought of carrying out of seminars on fights outside Russia?